Stonehaven Tennis Club Grand Prix 2018 finalists. 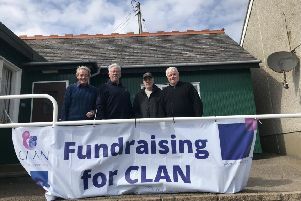 The Stonehaven Tennis Club Grand Prix ran over the last two weekends in March. In the ladies event Varada Kamate beat Sophie Robinson 6-2, 6-1 whilst Annabel Burns beat number two seed Christine Lockhart. Varada defended her title from last year with a 6-4, 6-1 victory over Annabel Burns. In the men’s semis Patrick Young beat Bruce McIver 6-2, 7-6(2) and Lee Wishart beat Daniel Colvin 6-2, 6-2. In the final Lee Wishart defeated defending champion and local, Patrick Young 6-2, 3-6, 10-3. Thanks to to John Purcell, Ken Melville and Ron Young for organising the event. Pic - Heidi Blanksma.